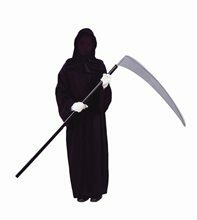 Howling Horror Child Costume;Robe with attached Hood, Waist Sash, and Scary Mask Gloves,Shoes and Sword are Not Included. 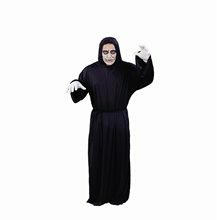 Deluxe Ringwraith Child Costume.Includes: Belt, hooded robe with mesh face and attached drape.Available Size: Boys - Small, Boys - Medium, Boys - Large. (See Size Chart For More Information) *Shoes and Gloves Not Included. Accessories Sold Separately. 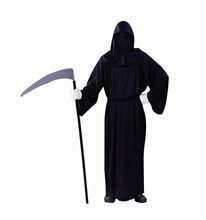 Now you can be Ringwraith from the Lord of the Rings movie. 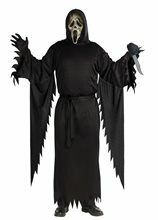 This Ringwraith Child Costume includes a belt and a hooded robe with mesh face and attached drape. The mesh face allows you to see out, but others can't see in!This is an Officially Licensed Lord of the Rings Product. Ghost Ship Pirate Child Costume.Includes: Shirt with detachable chest piece, Half mask with attached hair, Waist tie, Bandana, Boot covers and Pants.Available Size: Child - Medium (8-10), Child - Large (10-12), Child - XLarge (12-14). (See Size Chart For More Information) *Shoes and Sword Not Included. Accessories Sold Separately. 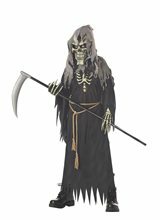 He'll become one of the high seas living dead in this child Ghost Ship Pirate Zombie Halloween costume. Scary pirate zombie Halloween costume for boys. Features shirt with detachable chest piece, half mask with attached hair, waist tie, bandana, boot covers and pants.